Danny Phantom is a little cartoon that premiered on Nickelodeon back in 2004, and I must confess that until this DVD release, I had never heard of the show. What happened to me? I used to watch every cartoon that I could! Stupid growing up... well, I still do watch a lot of cartoons, but nowadays there are just so many that watching them all would be a full time job. Anyway, back to Danny Phantom. The show is about this 14 year old kid named Danny who can turn into a ghost and hunts other spirits that aren't so friendly. The opening theme song explains that Danny's parents built a ghost portal so that they could look into the spirit world, but couldn't get it to work. Then the animation during the song shows Danny stepping into the portal device and pressing the "On" button, thus activating the portal and turning him into a ghost. Wait... they built the portal and didn't know that they built an "On" button? The theme song continues on, telling us that Danny now has the ability to fly, to phase through solid objects, and to turn invisible. I like that the theme song tells you the main setup of the show so that you can pretty much drop in on any episode and understand what's going on. I was disappointed, though, that the first episode didn't cover any of the origin story. It also doesn't cover why his parents became so obsessed with ghosts. The first episode takes place a month after the accident mentioned in the theme song, and has Danny still learning to control his powers. The ghost portal is still open for some reason, and a lunch lady ghost escapes. So Danny not only has to battle and capture this ghost, but he has to do so while dealing with school bullies, faculty, and his parents. Luckily he has a couple friends to help him out, the tech guy Tucker and the goth chick Sam. This is an action series aimed at young boys, with both the art and stories being much simpler than series such as Avatar: The Last Airbender, Oban Star Racers, and the new Thundercats. Each episode stands on its own, as there is no overall story arc, but the shows are still entertaining and are sprinkled with comedic moments, most of which usually hit the mark. Danny's father is often a major source of comic relief seeing as how he is incompetent at almost everything, including ghost hunting. Danny's mom, on the other had, is both intelligent and athletically skilled, which is probably where Danny gets his ghost fighting talent. And Danny's sister is a very smart overachiever who at first bickers with Danny like brothers and sisters do, but then helps him out secretly once she learns his secret. This set contains 4 discs with all twenty episodes of the first season. There are zero extra features, which is too bad. I would have like to heard from the creators or seen the vocal talent. The show is enjoyable enough, and I think kids would enjoy it, but it doesn't really have a lot to offer a more mature audience. It actually kind of reminded me of The Powerpuff Girls, which I used to watch all the time. It's a decent action cartoons with some comedy thrown in, but it's not too deep so makes for a good show to have on in the background while working on the computer or doing other stuff. Ready to take a trip to the other side? 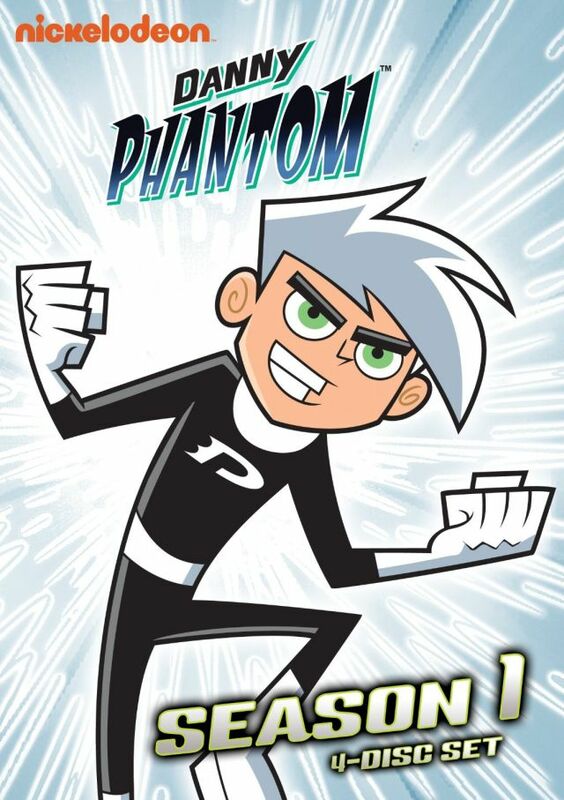 Part boy, part ghost Danny Phantom, one of Nickelodeon’s most popular animated characters, finally arrives on DVD! Get ready to huntghosts on September 13, 2011, when Shout! Factory releases Danny Phantom: Season One on DVD. Featuring all 20 spooky and hilarious episodes, Danny Phantom: Season One follows the adventures of Danny Fenton – a regular boy by day, a ghost hunter by night except that as fate would have it, he’s part boy part ghost! Long anticipated by fans, Danny Phantom: Season One has not been available in stores until now. A must have for Nickelodeon fans and DVD collectors, the four-disc DVD set will retail nationwide for $29.93. Aside from other-worldly action, adventure and homework, Danny Phantom: Season One boasts an all-star voice cast which includes David Kaufman (The Buzz on Maggie), Grey DiLisle (Rugrats, The Fairly Odd Parents), Rickey D’Shon Collins (Recess), Colleen O'Shaughnessey (Naruto), Rob Paulsen (Pinky and the Brain), Kath Soucie (Dexter’s Laboratory, Ben 10), Martin Mull and Frank Welker (Transformers). One of the most memorable Nickelodeon cartoons, Danny Phantom stars 14-year-old Danny Fenton, an unpopular but good-natured boy attending Casper High School in his small American hometown. Danny lives with his strange, ghost hunting parents Maddie and Jack as well as an overbearing 16-year-old sister, Jasmine. One day, while exploring his parents’ Ghost Portal, Danny accidentally turns himself into a half ghost boy launching a series of memorable adventures. Accompanied by his best friends Samantha and Tucker, Danny battles ghosts, the spiteful ghost hunter Valerie Gray, his ghost hunting parents all while keeping his new identity a secret! Created by Butch Hartman for Nickelodeon and produced by Billionfold Studios, Danny Phantom premiered on Nickelodeon in 2004 and ran until 2007. The show also aired on TeenNick from 2004-06 and currently airs daily on NickToons.